Do you love rainbows but hate have to wait to actually see one magically appear after it rains? 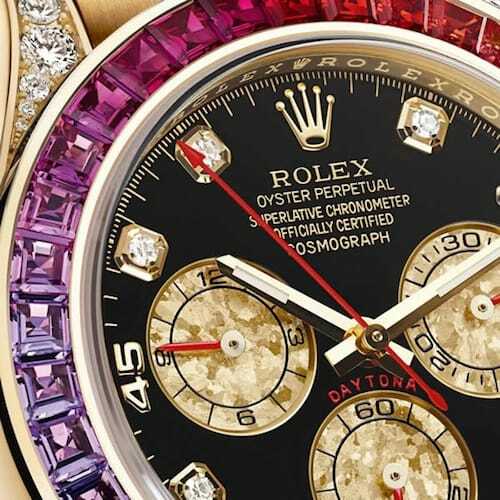 You don’t have to anymore, thanks to the new Cosmograph “Daytona Rainbow” wristwatch designed by the famed Swiss watchmaker, Rolex. This new watch is like no other and as soon as you put it on, you will be the talk of the town. Once you add this colorful wristwatch to your wardrobe, it will brighten even the gloomiest of days and whenever you feel like it. Wear it with jeans or put on an evening gown and the Daytona will be a perfect accessory. Rolex Daytona Rainbow is certainly colorful. The watch features an 18kt yellow gold case and bracelet, and 40mm dial. However, the true highlight of this piece de resistance is its bezel which is set with 36 mesmerizing and gleaming sapphires in all of the lovely colors of the rainbow. From bright pinks and mauves to greens, yellows, blues, and oranges, every time you look to see what time it is, you will smile. And the best part? You won’t have to wait until the rain ends! Additionally, there’s even more sparkle thanks to the 36 diamonds which are studded on the case and another eight featured on the dial. Put these together with the quality craftsmanship Rolex is known the world over for and its perfection spelled with a capital P.
The Rolex Daytona Rainbow is a watch that is unique for its bezel and jewels. The Daytona is not only smart looking but it is also an investment. Buy it new or visit Bob’s Watches, the first and only Rolex Exchange, for previously owned Rolex watches. When you buy a pre-owned Rolex, it is often a fraction of the cost from Bob’s Watches, in the business of selling and repairing pre-owned Rolex watches since 1999. Like the Rolex brand itself, Bob’s prides itself with a great reputation, quality watches, and superb customer service. 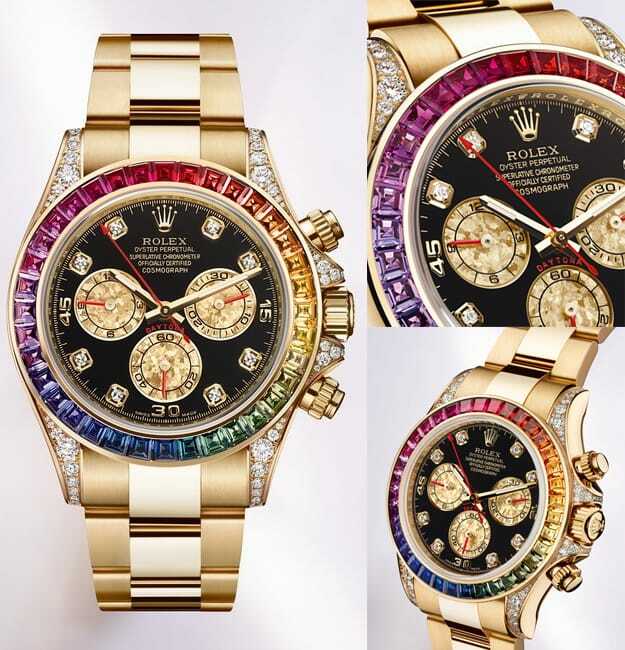 Catching a rainbow has never been easier now that Rolex has introduced the world to its Daytona Rainbow wristwatch. The only thing you might find to be missing are the unicorns frolicking nearby!